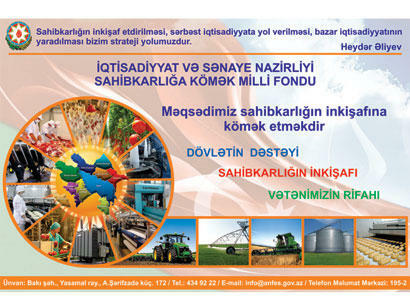 The main direction of concessional lending under the National Fund for Entrepreneurship Support (NFES) in the coming year will be the development of small business, the Azerbaijani Economy Ministry said on December 27. The ministry noted that it is also planned to pay attention to the creation of agro-parks, complexes for cattle breeding and hothouses, large farms and horticultural farms, logistics centers as well as points of meat cutting and processing. Moreover, the priorities of the NFES include the establishment of enterprises for production of bread and building materials and for processing of fruit and vegetable products, according to the ministry. During 2017, NFES allocated soft loans worth 146 million manats ($86 million). These loans were provided to about 1,953 business entities for the implementation of investment projects with a total cost of 635.6 million manats ($374 million). As many as 65 percent of these loans fell on the regions of Azerbaijan, while the remaining 35 percent accounted for Baku. About 67.6 percent of the soft loans were allocated for the development of the agricultural sector, while 32.4 percent were provided for the development of production and processing of various industrial products. Allocation of soft loans is directed at countering the effect of the global economic crisis to the Azerbaijani economy and minimization of the country’s dependence on the oil sector by improving other industries throughout Azerbaijan. The country takes steps to diversify the national economy and provide for the development of the agricultural and other spheres. Currently, Azerbaijan ranks 63 out of 189 countries in the World Bank’s ease of doing business index, and work to improve this index even more is being implemented.